Makanyi Private Game Lodge is ideally located overlooking an active dam in the Timbavati Private Nature Reserve. On one particular morning, guests were enjoying a cup of coffee on the deck before heading out on a morning game drive, when we suddenly noticed movement by the dam. 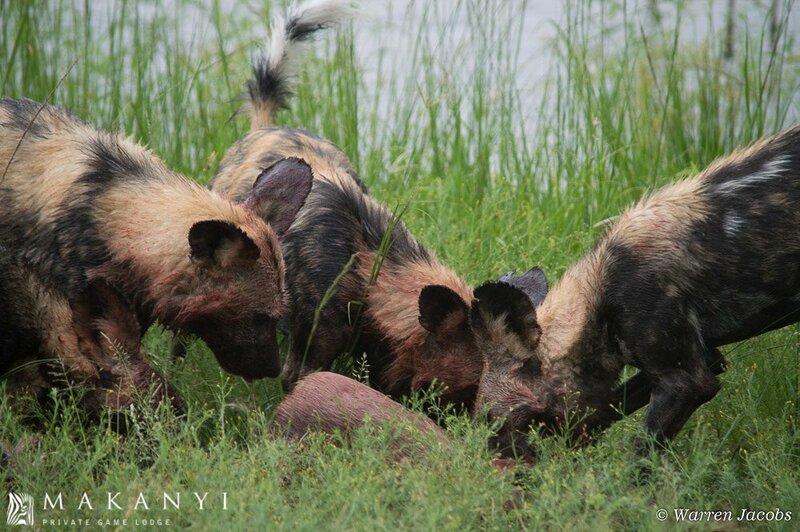 A pack of wild dogs had made their way to the dam to quench their thirst. We all jumped into the vehicle and headed down for a closer look. Upon arrival, we noticed that the pack had chased a helpless impala into the dam. The impala was looking in all directions for an escape route but the dogs had every escape route covered. A standoff ensued and, after some time, a few of the dogs lost interest and disappeared into the bushes. The remainder of the dogs lingered and we could see that they were getting restless. A member of the pack decided to try his luck and chase the impala out of the water but, as he leapt into the water, the impala headed into deeper water, which resulted in the dog eventually retreating.